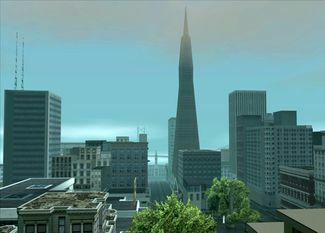 San Fierro's Financial district, as seen from the north end of Calton Heights. 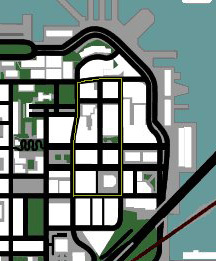 Financial is a district of San Fierro, San Andreas. As its name implies, it comprises a significant portion of the city's financial center. It is physically surrounded by Downtown, with the only other bordering district being Calton Heights to the west. This district is home to one of the city's most famous landmarks, the Big Pointy Building, which is a re-creation of the Transamerica Pyramid in San Francisco's financial district. This building's player-accesible roof provides panoramic views of the entire city, and an opportunity to test one's skydiving skills with the provided parachute. Financial is also home to food and clothing retailers, and is serviced by the city's cable car system. The police patrol this busy district heavily, and street and sidewalk traffic is commonplace. When Carl Johnson arrives in San Fierro, he realizes his work in this new city has only just begun. The derelict garage he won in the street race with Claude and Catalina is in desperate need of renovation, and the leaders of the Loco Syndicate, the entity largely responsible for the events leading up to this point, are located nearby. With the help of his sister Kendl, his old ally from Los Santos, Cesar Vialpando, and his newly acquired friends The Truth, Dwaine, Jethro, and Zero, Carl sets off to turn the garage into a successful chop-shop and destroy the Loco Syndicate once and for all. However, C.R.A.S.H. officers Frank Tenpenny and Eddie Pulaski, who have been watching Carl's activities very closely, arrive in Doherty to heap more tasks on Carl's already full plate. They demand that Carl frame San Fierro's District Attorney, who apparently has some compromising information on Pulaski. To do this, Carl must make his way over to the Vank Hoff Hotel in Financial, where he poses as a valet in order to steal the DA's car and return it to the Doherty garage where a few tons of marijuana are planted in the trunk. Carl then returns the DA's car to the hotel in time to phone the police tip hotline, after which the DA is promptly arrested. This page was last modified on 27 July 2012, at 14:39.